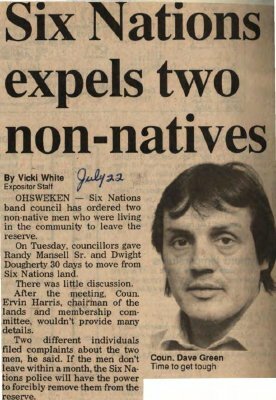 "Six Nations expels two non-natives"
OHSWEKEN - Six Nations band council has ordered two non-native men who were living in the community to leave the reserve. On Tuesday, councillors gave Randy Mansell Sr. and Dwight Dougherty 30 days to move from Six Nations land. Two different individuals filed complaints about the two men, he said. If the men don't leave within a month, the Six Nations police will have the power to forcibly remove them from the reserve. Mansell Sr., Randy ; Dougherty, Dwight ; Harris, Ervin.